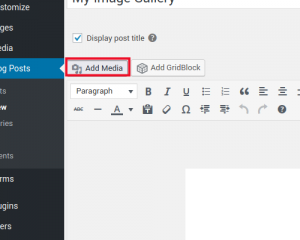 WordPress has made it easy for you to create image galleries in pages and posts. You can quickly create a gallery without anything but the base WordPress functionality – no plugin needed! We will walk you through the steps for creating image galleries in the steps below. Before you begin, you will need to make sure that you have some pictures loaded into the media library. 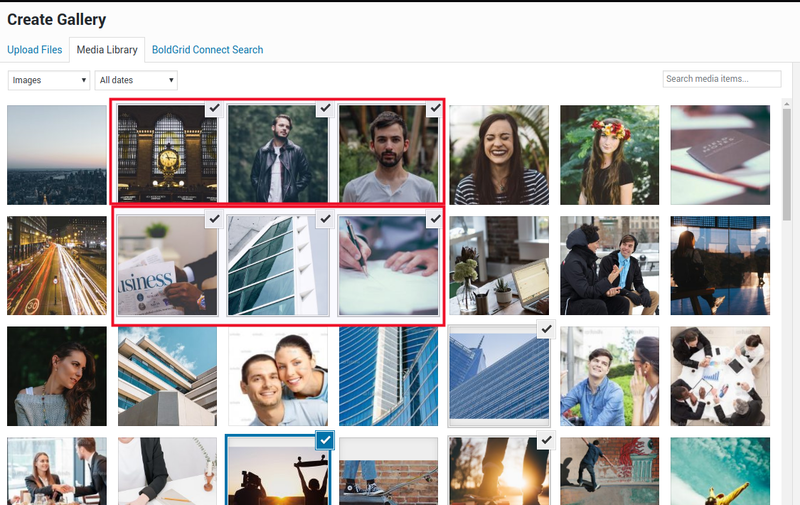 Upload some, or use the BoldGrid Connect Search to obtain some images before you begin the tutorial. 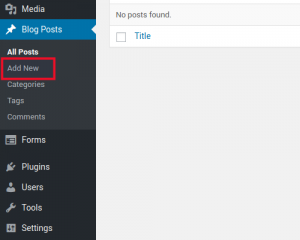 Hover over Pages or Posts in the menu at left, then click on Add New. Type in a new title for your new page or post. Next, click on Add Media. When the Media Library appears, click on Create Gallery in the top left corner. Select the images that will be part of your image gallery. 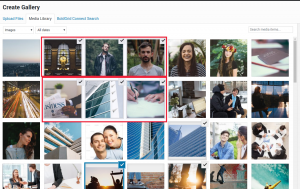 You can select multiple images and each image thumbnail will get a checkmark in the top right corner after being selected. You will also see a smaller thumbnail listing of the images appear at the bottom as they are selected. 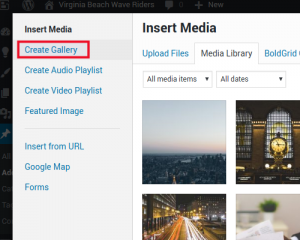 You may also upload images at this point, but you will need to select them in order to make them part of the gallery you are creating. 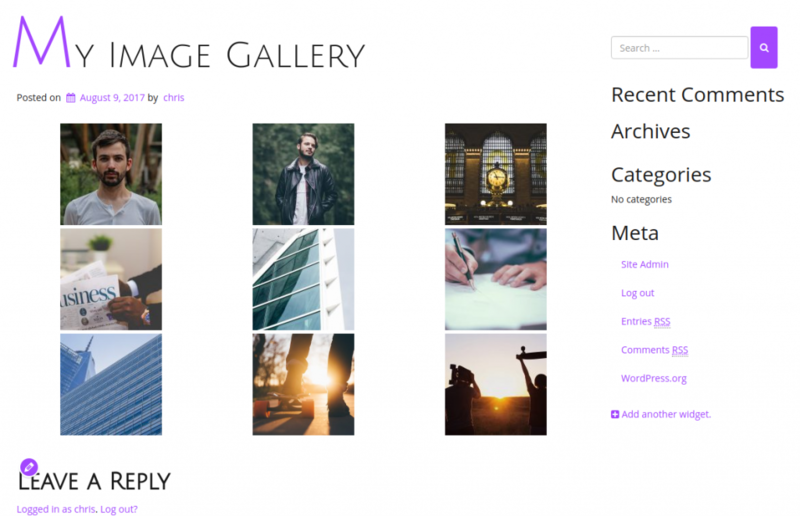 When the images have been selected, click on Create a New Gallery in the bottom right corner. 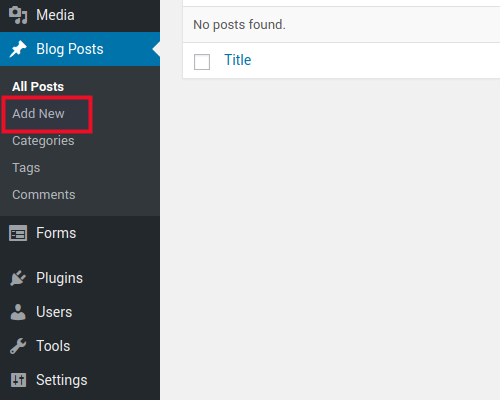 Once you create the Gallery, the Edit Gallery interface will appear. You can cancel the gallery creation, edit the gallery, or finalize it by clicking on Insert Gallery in the bottom right-hand corner. 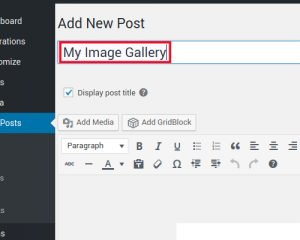 After you have added the gallery to your post, you can view it in your BoldGrid site in order to see how it operates. You will see a post with several images that you can click on to see the image in a larger size. Congratulations, you now know how to create an image gallery!